William Paulding, Jr. received 23 votes as William Paulding. Samuel L. Mitchell received 1 vote as Samuel Mitchell. William Paulding, Jr. received 14 votes as William Paulding. The Columbian (New York, NY), New-York Spectator (New York, NY), American Citizen (New York, NY), New-York Evening Post (New York, NY), New-York Herald (New York, NY) and Commercial Adverister list Peter A. Jay with 5127 votes. The Columbian. (For the Country) (New York, NY) New York of May 5, and several other newspapers in May 1810 which list results for individual towns, list slightly different numbers for Richmond County (339 and 331), and some only list results for Samuel L. Mitchell and John Coles, mentioning that there was a "Republican majority" of 8. 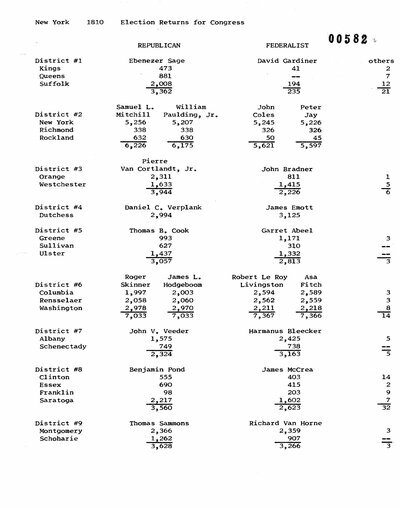 The later newspapers, from June 1810, list the totals in Richmond County for the candidates as 338 and 326. "Richmond County[.] Safe After all. The following is the official return from that county, by which it will be seen, contrary to the first report, that a republican member of the assembly is elected. Last year a federalist represented the county. The exultation of the federalists on their supposed success was ludicrously great. A procession was formed the morning after the election, of which major Snowdon's horse, caparisoned, led the van : Bonfires of tar-barrels graced the triump : a supper and copious libations, at the expence [sic] of Mr. Connor, the fortunate candidate, were devoured, and the air rent with acclamations. Major Snowden, too, was to give a supper on Thursday [to-morrow] evening. But behold, yesterday, at ten o'clock, the official canvas gave a republican majority for governor, congress and assembly." The Columbian (New York, NY). May 2, 1810. William Paulding, Jr. received 9 votes as William Paulding. The Columbian (New York, NY) of May 9 lists John B. Coles with 35 votes. New-York Evening Post (New York, NY). April 30, 1810. American Citizen (New York, NY). May 1, 1810. Commercial Advertiser (New York, NY). May 1, 1810. The Columbian (New York, NY). May 2, 1810. New-York Herald (New York, NY). May 2, 1810. The Long Island Star (Brooklyn, NY). May 3, 1810. Public Advertiser (New York, NY). May 3, 1810. The Columbian. (For the Country) (New York, NY). May 5, 1810. The New York Journal (New York, NY). May 5, 1810. New-York Spectator (New York, NY). May 5, 1810. The Albany Register (Albany, NY). May 8, 1810. The Columbian (New York, NY). May 9, 1810. American Citizen (New York, NY). May 14, 1810. Columbian Gazette (Utica, NY). May 15, 1810.